Here's my card for this week's sketch at Freshly Made Sketches. I used the layout for a quick clean and simple Father's Day design. I used one of the tie stamps from the SugarPea Designs Terrific Ties set and olive and kraft pigment inks to stamp a trio of ties across a cream panel. 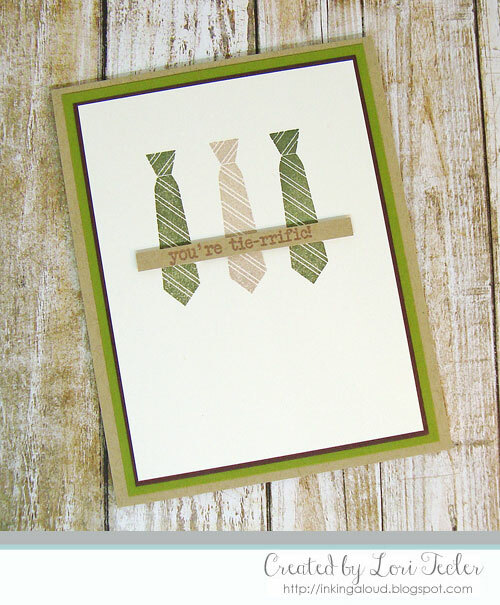 The set's "you're tie-rrific" sentiment was stamped in dark brown ink on a narrow kraft cardstock strip. I used foam tape to position the sentiment strip over the tie trio. The panel was matted on dark brown cardstock, then on olive green cardstock before it was adhered to a kraft card base. Great card Lori! I love those ties and the sentiment! Very masculine! Thanks for joining us this week at Freshly Made Sketches! I love this Lori! I might have to CASE this...it's so cool!